President George Bush's state of the union address was the opening pitch in his bid for a second term in office, most American media pundits agreed. But some commentators were surprised at the priorities in the president's speech. Pundits had predicted that Mr Bush would deal swiftly with international affairs and concentrate his energies, and rhetorical polish, on domestic affairs. But National Public Radio's Daniel Schorr was among several analysts who thought the president's performance was strongest in his defence of his foreign policy and muddled in laying out his domestic agenda. In the first half of the speech, Schorr said the president was saying "We are at war. I am a war leader. Stay out of my way". But some of his domestic initiatives sounded less like policy and more like a Sunday sermon, Schorr said. For the New York Times, "Mr Bush cast himself as the steady commander in chief of what he portrayed as a nation at war, seeming to suggest that changing the leader mid-battle was risky". But in an editorial, the paper decried what it deemed the absence of big ideas. "Mr Bush, who devoted an entire paragraph to decrying the use of steroids in sports, stands second to nobody when it comes to tiny symbolic gestures," it said. "Many of his larger thoughts, meanwhile, were vague to the point of meaninglessness." One of Mr Bush's bolder domestic pledges was to make permanent the temporary tax cuts - but this won him little applause from commentators. "In the face of record deficits, a costly new prescription drug program, and mounting costs in Iraq and Afghanistan, it was as breathtaking as it was unsurprising that Mr Bush repeated his call to make the tax cuts permanent," fumed the Washington Post. Many pundits agreed that the speech was an attempt to shore up support among those already backing him - "base maintenance", as Schorr put it - in a bid to draw the electoral battle lines. And the response from deputies was markedly partisan, many noted. 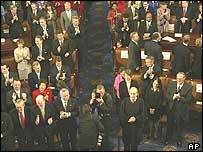 "The applause was mainly coming from one side of the aisle," said CNN's Paula Zahn. "A year ago, the president made it clear that he would go to battle with Saddam Hussein. The president made it abundantly clear that he is ready to go to battle with the Democrats," Zahn said. 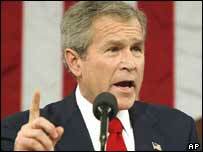 But there were mixed views on whether Mr Bush succeeded in delivering an early blow to Democrats' hopes. "If this whole thing was intended to upstage the Democratic contest, I don't think it did," Schorr said. But the New York Times praised his performance. "Mr Bush spoke like a man who is headed to the Moon and Mars," it said, "while the Democrats are headed to Manchester, New Hampshire." The New York Post focused on the unexpected shift in tactics following John Kerry's surprise win at the Iowa caucuses. "The problem that Kerry poses for the Bush campaign is that he's a Vietnam vet with four terms in the Senate and experience in foreign policy, in contrast to Dean, who has no international experience," it said. "...For the Bush political team, Dean would have been an easier target because of his populist anti-war message."